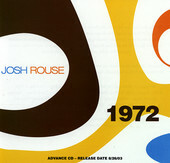 Singer-songwriter Josh Rouse expands his palette and diversifies his sound on his fifth full-length, 1972. From the soulful, vibrant, and upbeat love anthem, "Love Vibration", through the jazzy-pop, through the sullen, somehow bouncy "James", Josh Rouse makes all ten tracks on this album matter. Incorporating the above sounds - soul, jazz, pop, folk, and rock - and more, Rouse crafts heartfelt melodies and serves them up with style and substance, a rare combination these days, but something Rouse does with ease, never sweating it. If music could smile, even in the face of adversity, Rouse's tracks on 1972 would be as bubbly as could be, no matter what. I'll give it an A.